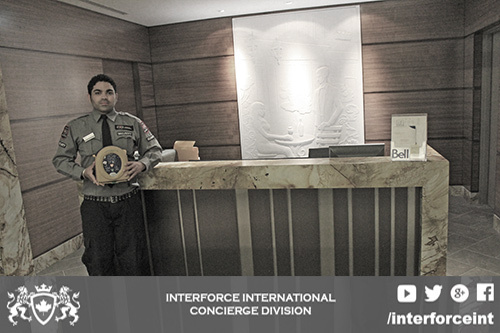 Interforce International Security provides a wide variety of security guard and protection services to businesses and communities located in the greater Toronto area. Core objective is to neutralize any existing security threats and breaches, and to maintain a strong security presence in order to prevent new threats from arising. Criminals with the intent to commit a criminal and/or indictable offence will be discouraged to conduct their illegal activities on your property due to the strong security presence we provide by our security guards. In the event of illegal activity occurring on your property, our security guards will enforce the Criminal Code of Canada and the Trespass to Property Act to neutralize the security threat immediately and ensure they are either issued a Provincial Offences ticket, and/or sent to the Police station for prosecution. Security Guard Ali Latif demonstrates the use of an AED defibrillator: A device that can save lives in the event of a cardiac arrest by shocking the heart to re-establish a regular heart rhythm. Security Guard James Cao used the "guard scanner" which records time, date, and location. The data is recorded on a rugged electronic device in which the guard's patrol history can be viewed. Before we provide security guard services for your facility, one of our personnel will visit your property for a site tour in order to perform a threat survey. This is a crucial first step in determining how our security personnel will perform their core duties. By finding the root cause of existing and potential threats, our security team will know exactly what to target, and how to neutralize the threats. Interforce International Security was called to provide security guard services for a Bingo Hall located in Toronto. Their issues included petty theft, and people smoking too close to the building’s exteriors, in which the City of Toronto warned them several times to have all smokers smoke no closer than 10 feet from the entrances. After a site tour and threat survey, Interforce International Security was able to resolve all the security threats that posed a danger to the Bingo Hall by frequent foot patrols around all gaming machines and gambling tables in order to show to the public a strong security presnece, which in return discourage petty theft. A red line was also painted outside the facility with clear markings to smoke behind the line. After these security measures were in place, petty theft dropped by 75% and smokers who breached the 10 foot no smoking barrier decreased also by 75%. A construction company approached Interforce International Security for fire watch protection for their town home complex under construction. Interforce Internationl conducted a threat survey of the compound and determined numerous threats that can (and would of led) to a catostrophic fire. By using thermal imaging cameras, Interforce International was able to see “hot spots” inside the construction site which could of resulted in a fire. The biggest threat was the abundance of cigarette butts on the ground, which could slowly but surely cause a fire on the wooden studs. 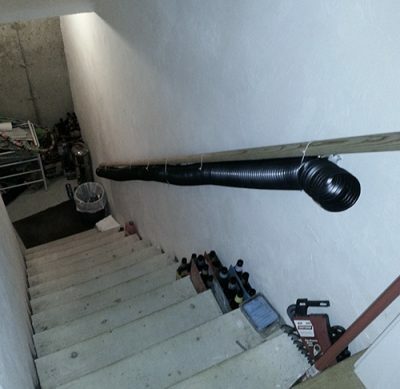 Also, the lack of circulation where the propane burners were placed were addressed, which could result in deadly carbon monoxide poisoning for the construction workers. Live electrical wires can easily be seen from the thermal imaging cameras which can detect abmornally high temparatures, which can lead to an electrical fire. Now that the threat survey was conducted, Interforce International Security now knows every single threat that currently exists on your property, and protocols on how to neutralize them. Standard operating procedures are then created which are tailored specifically to your property. Security personnel are briefed about the findings in the threat survey and are trained to adhere to the protocols from the SOPs in order to eliminate exiting threats, and to prevent new ones from coming. Prostitution in stairwells. Used condoms discarded. Theft occurring in one specific section of a store. Major mechanical issues with condo equipment. Theft of goods at electronics distribution warehouse. Loitering in common areas outside apartment building. Frequent security guard patrols in targeted floors & stairwells. Conxex mirrors installed, aisle opened up to avoid corner. 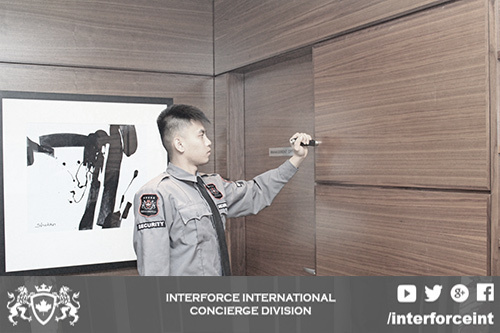 Daily routine inspections done by concierge. Move lunch room behind metal detector, wand employees. Once all the noted threats have been eliminated, our work does NOT stop there. This is where many other security guard companies fail. They are successful at eliminating all the security threats, but get too comfortable. This is also where a lot of businesses make a grave mistake by concluding the security guard services once things are under control. The security threats WILL return, and businesses are encouraged to be pro-active instead of re-active. Hiring a security guard company to protect your property on a long term basis in the beginning is far more beneficial than hiring security temporarily until the problem is solved, or hiring security in a frantic manner because a security breach occurred on site and you’re desperate to get a security guard to patrol your facility ASAP. A PERMANENT security presence is an effective solution to the safety and security of everyone who lives, works, and/or shops on your property.